dance pop | Sonic Smash-Music! 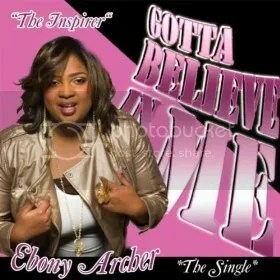 The inspirational singer and songwriter of pop and R ‘n’ B known as Ebony Archer has released her latest single, “Gotta Believe in Me.” The track has been proudly published on the Inspired by Purpose Inc. independent music label without any involvement from the corporate music power structure. An unstoppably upbeat and uplifting single that has been picking up steam since its first appearance online, “Gotta Believe in Me” by Ebony Archer is a dance-floor high point in indie music that doesn’t show any sign of slowing down. Ebony Archer cites as main artistic influences such legends of pop, gospel and soul as Whitney Houston, CeCe Winans, and Aretha Franklin. Fans of these singers will find many happy parallels between their respective styles and that of Ebony Archer, herself, whose invigorating, natural jubilance and spirited tenacity finds her in the same proud echelon, and whose unassuming, “Watch this!” demeanor on “Gotta Believe in Me” is both infectious and refreshing. These sentiments have been so uniformly echoed throughout the World Wide Web since the release of Ebony Archer’s single that the high quality of her singing – not to mention the equally lofty caliber of her songwriting – sometimes goes unmentioned. This is an unfair mistake, as Archer’s natural singing voice is both clarion and crystalline, her tones landing somewhere between Y2K-era Cher and the more danceable offerings from Whitney Houston. In view of Archer’s long experience, this should not come a surprise. Since then, Ebony Archer’s goals have enlarged to include the betterment of society at large, and to read the accolades posted on her official website (link provided below) her efforts have not been in vain. It is exactly this mission which has caused her to be called in various locales, “The Inspirer,” a title which she proudly carries from state to state on her popular music tours. Ebony Archer has shared the stage with such names as Yolanda Adams, R. Kelly, Celine Dion, Nick Carter, and others. In 2001, she was featured in R. Kelly’s video, “The World’s Greatest.” She won the runner-up award in the national “Black Girls Run” competition with over 40,000 votes, and is widely expected to exceed even these achievements before long. “Gotta Believe in Me” by Ebony Archer is available online worldwide.